The Hallux or first toe, is the medio-distal part of the foot. It is formed by the first metatarsal (articulates with two sesamoid bones), the first proximal phalanx and the first distal phalanx. So the hallux is formed by three bones instead of four, unlike the other toes who have an extra bone called the intermediate phalanx. The first toe has three synovial joints. The first joint is the art. tarsometatarsae and is situated between the medial cuneïforme bone and the first metatarsal, it does not allow a lot of movement. The second joint, art. metatarsophalangae, connects the first metatarsal and the first proximal phalanx. The joint allows flexion and extension of the first toe and a small ab- and adduction towards the centre of the second toe. It is also reinforced by ligaments (lig. metatarsophalangae collateralia and lig. Metatarsophalangae plantaria). The last joint, art. Interphalangae, is the connection between the two phalanges of the first toe. This joint only allows flexion and extension and it is also reinforced by ligaments (lig. Interphalangae collateralia and lig. Interphalangae plantaris). As mentioned earlier, there are two sesamoid bones that articulate with the first metatarsal bone. These sesamoid bones protect the tendons of the muscles that are attached to them but their main function is helping those muscles generate more force by extending their levers. 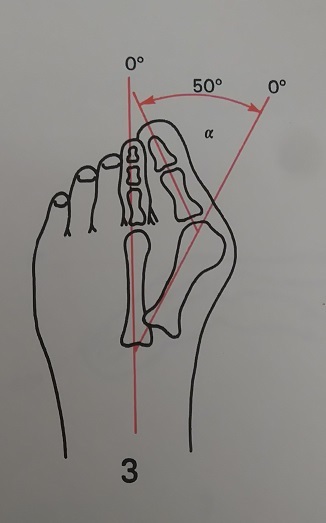 The angle created between the lines that longitudinally bisect the proximal phalanx and the first metatarsal is known as the hallux valgus angle. Less than 15° is considered normal. Angles of 20° and greater are considered abnormal. An angle of 45-50° is considered severe. In this foot deformity, the medial eminence becomes prominent as the distal end of the first metatarsal drifts medially and the proximal phalanx deviates laterally. The first MTP becomes subluxed, leading to a lateral deviation of the hallux, medial displacement of the distal end of the first metatarsal and bony enlargement of the first metatarsal head . The mechanism behind this hallux valgus formation starts with the stretching of the abductor hallucis muscle (for example as a result of wearing tight shoes). The base of the first proximal phalanx starts to lateralise and abducts. During gait the forefoot is turned into pronation, which stretches the medial collateral ligament and the capsular structures of the first MTP joint. As the first MTP joint consists of multiple bones, ligaments, sesamoid bones and has muscles nearby, structures influence other structures as they move or stretch. That way, once a threshold degree of valgus of the first PP is reached, the first metatarsal bone starts his way into a varus position. This way, the hallux is pushed into a valgus position. 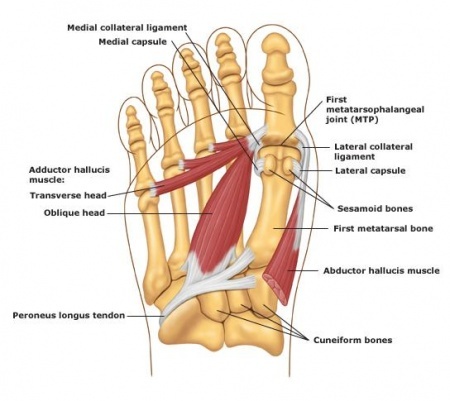 The capsule gets weaker and the abductor hallucis tendon turns into a flexor of the hallux. As it turns worse, multiple muscles tend to worsen the situation as their axis of pull is lateralized. Radiographs are used to determine the presence of hallux valgus by looking at the angle formed between the longitudinal bisections of the first metatarsal and the proximal phalanx. If the angle is greater than 15°, hallux valgus is diagnosed. An angle of 45-50° is considered serious. The degree of displacement of the sesamoids and the level of osteoarthritic change within the first MTP joint should be considered as well. It is not always possible or necessary to take radiographs to determine the severity of hallux valgus. Therefore, the Manchester scale was developed .The Manchester scale consists of standardized photographs of four types of hallux valgus: none, mild, moderate and severe. Research has shown that this scale is reliable in terms of both re-test and inter-tester reliability (kappa values of 0.77 and 0.86). In the study by Roddy et al (2007) , the authors developed a tool that consists of five photographs instead of four. Each photograph had a hallux valgus angle increased with 15°. This tool had a good retest reliability (kappa = 0.82) and is also a good tool to use to determine hallux valgus severity . Both scales (the four-level classification or dichotomised scale) can be used to determine the severity of hallux valgus. Physical examination should be performed with the patient both seated and standing. During weight bearing, the deformity is generally accentuated. During examination, the presence of pes planus and contracture of the Achilles tendon should be evaluated. The height of the longitudinal arch and hallux, with its relation to the lesser toes, are also examined . The condition of pes planus may be helped by an orthosis. Severe pes planus can lead to a recurrence of hallux valgus following surgery. If non-operative treatment fails, surgery could be considered . (Level of evidence: 4) Before an operation is chosen, the severity of the hallux valgus has to be determined. In order to do that, a weight bearing plain film radiography is used. This procedure is frequently used for mild deformities. The osteotomy is in a "V" shape, a sagittal saw is used in a medial to lateral direction inside the first metatarsal head. The loose fragment is then placed differently to correct the first metatarsal angle. The fragment is fixated with pins or screws. A wedge is removed from the head of the first metatarsal head in order to get a better organisation of the articular cartilage. The wedge is situated on the dorsal side and medially based. In some cases, the surgeon decides that is necessary to rotate the articular cartilage. A screw or K-wire is used for fixation. When the deformity is moderate to sever, the scarf procedure is a frequently used option. The osteotomy is longitudinal, in a medial to lateral direction, inside the shaft. The capital piece is moved more to the lateral side and stabilized with two screws. Base procedures are mostly used for severe deformities, so is this one. A wedge is made in the proximal metatarsal, on lateral side. When the wedge is removed, the distal part is translated to the lateral side causing the gap to close and the first metatarsal to align with the second. The minimum fixation is a bicortical screw. This is another option when a severe deformity is observed. By removing a piece of the articular cartilage of the medial cuneiform and the base of the first metatarsal, a fusion between the two is created. The fixation can be external, by the use of a plate or screws. An extra correction can be constructed when a wedge is made on the medial side of the first proximal phalanx. The gap is closed by pushing the distal part to the medial side and fixating it. The similarities with the closing base wedge procedure stand out. For all surgical procedures, the patient is allowed to ambulate in a post-operative shoe immediately after surgery. Patients need to wear a post-op shoe and compressive dressings for 8 weeks. Long-term follow-up has shown equally positive outcomes after Chevron osteotomy for both patients both younger and older than 50 years of age. Stance phase: could be trained by performing a heel-strike in its physiological position at the lateral aspect of the heel. During gait training, verbal cues could be provided. As pain and inflammation settles, the focus of treatment turns to restoring normal toe and foot joint range of motion and muscle length. A foot posture correction Program to assist you to regain your normal foot posture. The ankle dorsiflexion exercise strengthens the ankle and lower leg muscles. The patient is positioned in long-sitting. The centre of the resistance band is placed on the top of the forefoot with the toes slightly pointed. The ends of the band are either held by an assistant or secured against an immovable object (e.g. a table leg). The patient then dorsiflexes the ankle, pulling "towards their nose," working against the resistance of the band. 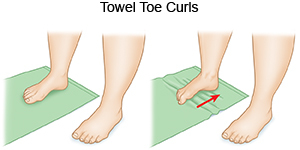 Towel curls The patient spreads out a small towel on the floor, curling his/her toes around it and pulling the towel towards them. The goal of this stage of rehabilitation is to return the patient to his/her desired activities. Everyone has different demands for their feet that will determine what specific treatment goals need to be achieved. Bunions will deform further with no attention and bunion-associated pain has a tendency to return. The main reason is biomechanical. In addition to muscle control, the physiotherapist should assess foot biomechanics and may recommend either a temporary off-the shelf orthotic or refer for a custom-made orthotic. High heeled shoes and shoes with tight or angular toe boxes should be avoided. Hallux valgus can be confused with other diseases or injuries during diagnosis. In the early stages, the redness and pain can be confused with an inflammation, infection or gout of the first MTP joint. Pain related to gout suddenly appears while onset is gradual with hallux valgus. As well, semi uric acid level can be tested to differentiate between the two (since it is increased patients with gout). Other forms of arthritis and their consequences for example hallux rigidus can be confused with hallux valgus as well as being a result of the deformity. For example, a joint affected by septic arthritis is also red and swollen. ↑ Prevalence of hallux valgus in the general population: a systematic review and meta-analysis. Nix S., Smith M., Vicenzino B. Journal of Foot and Ankle Research 2010 (1a). ↑ Internet, Bunion, (http://emedicine.medscape.com/article/1235796-overview#a11), 2016-11-11. ↑ Barnish MS, Barnish J. High-heeled shoes and musculoskeletal injuries: a narrative systematic review. BMJ Open. 2016;6(1):e010053. doi:10.1136/bmjopen-2015-010053. ↑ MOL, W. et STRIKWERDA, R., Compendium orthopedie, De tijdstroom, Lochum, 1977, 343p. (p.232-234). ↑ SOBEL, E., Hallux valgus, assessment and conservative management and the role of faulty footwear, October 2001, (http://podiatrym.com/cme/oct01.pdf). ↑ Ashman CJ, Klecker RJ, Yu JS (2001) Forefoot pain involving the metatarsal region: differential diagnosis with MR imaging. Radiographies 21:1425–1440. ↑ MCRAE, R., Clinical Orthopaedic Examination, Churchill Livingstone, Edinburgh, 2010, 323p (p.236-238).